Takeaway: After grounding in tadasana and connecting with your root chakra, you'll feel much calmer, collected and refreshed. If you’ve been to a yoga class, you’ve likely heard your instructor say “chakra” in relation to specific points in the body. When I was new to yoga, I didn’t fully understand what a chakra was and feared asking questions because I didn’t want to be pinpointed as a yoga newbie! It wasn’t until I had become more invested in my yoga practice that I began reading about chakras. Through this self-directed learning, I started to understand the importance of chakras and how they worked together to support energy throughout the body. It really helped deepen my practice. Here I'll focus on the first chakra (root chakra), why it's important to balance and how to do so through the practice of tadasana (mountain pose) -- one of the most fundamental asanas. Literally translated, chakra means "disk" or "wheel," and refers to the circular movement of energy throughout your body. There are seven chakras, starting from the base of the spine and extending upwards to the crown of the head. The muladhara (root) is the most instinctual chakra. It represents stability, security and your basic needs. The svadhisthana (sacral) chakra is your center of creativity and sensuality. The manipura (solar plexus) chakra is a source of personal power. The anahata (heart) chakra is a source of love and connection. It bridges the lower chakras of matter and the upper chakras of spirit. The vishuddha (throat) chakra is your source of verbal expression. The ajna (third eye) chakra is connected to your intuition. The sahasrara (crown) chakra is your center of spiritual connection. It goes without saying that the seven chakras are all interconnected. But what is the muladhara chakra, and why is it significant to your practice? Having balanced chakras commences with the muladhara chakra as it is the first chakra in the body. Physiologically, the root chakra encompasses the first three vertebrae at the base of the spine, the bladder and the colon. If you think about this chakra like the roots of a tree, the muladhara chakra provides a stable foundation to grow and reach your full potential by essentially connecting you to Earth’s energy. When this chakra is balanced, you tend to feel more grounded, emotionally stable and safe. People with a balanced root chakra often have remarkable resilience, compassion and patience. They can also often tackle whatever the universe throws their way while maintaining a sense of calmness. Like all chakras, your muladhara chakra can become unbalanced, leading to emotional burnout, lethargy and lack of focus. The good news is you can turn to yoga to re-establish balance this chakra and achieve a more harmonious life. There’s a reason that almost every yoga practice begins in tadasana. Don’t be fooled by its simplicity because it’s quite powerful and strong, much like its name. Tadasana can be extremely helpful for balancing the muladhara chakra. Not only does it encourage a deeper connection with Earth, but it helps ground you in the present. I've personally seen the benefits of tadasana for balancing my root chakra. Whenever I’m having a stressful day or just need to press pause for a few moments, I head to a quiet space and come into tadasana. Like savasana (corpse pose), tadasana can stimulate energy from the muladhara chakra. Whether you’re in a yoga class or at the office, here’s how you can connect with your root chakra. 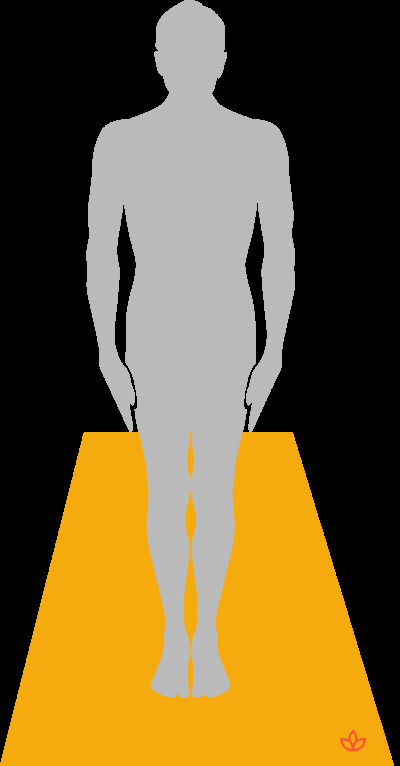 Stand at the back of your mat (or on a solid surface) in bare feet. Bring your toes together and heels slightly apart. Press your shoulders down and back. Open your chest. Place your arms alongside your body with palms facing your thighs. Eliminate any feeling of tension. Bring awareness to your breath, taking slow inhales and exhales. Feel your feet connecting to the earth. Spread your toes. Picture your feet rooting down into the earth. Feel the strong foundation it offers you. Continue breathing slowly and evenly for at least 10 breaths. Close your eyes to challenge your balance. I can’t emphasize how relaxing tadasana can be for the mind, body and spirit. After using tadasana to connect with my root chakra, I always feel so much calmer, collected and refreshed. While it’s important to keep your muladhara chakra in check, we need to remember that the chakras are like a wheel. When all seven are balanced, they provide more energy and can help us live a more fulfilled life.